Internet Download Manager is one of the best download managers available and which I also use , can increase download speed of upto 5 times. You can notice(see) the speed of the active downloads by viewing the “Transfer rate”. But only some people know that they can increase the downloading speed of IDM . It is very simple trick, you can just increase up the download speed by properly configuring the software so that your bandwidth is used maximum. So now I am going to show you the trick of how to increase speed of IDM. STEP 2 : Then, click on Downloads Tab in the IDM menubar and go to Speed Limiter. 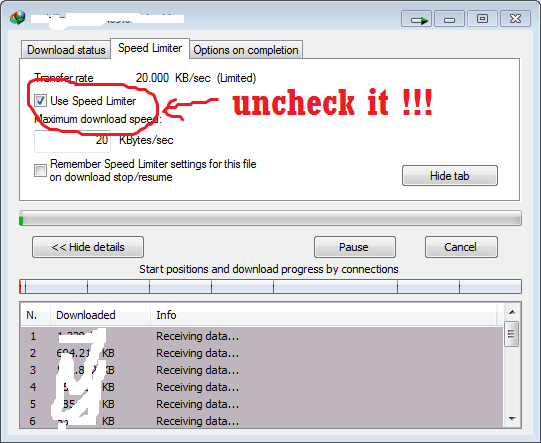 STEP 3 : Uncheck it so that there will be no speed limit on download speed. STEP 4 : Now, go to Options in the in IDM menu and change Connection Type/speed to HIGH so that more bandwidth of your connection will be used by IDM. STEP 5 : Now change the default maximum connection number to 16. Now click Ok and save the settings. You are Done. Now you can observe that the download speed has been increased upto a certain level. To use this trick firstly you have to install IDM on your pc/laptop. Now follow the steps given below. 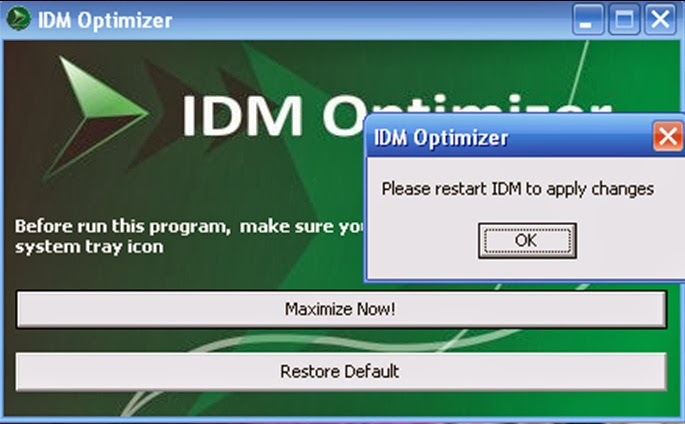 STEP 2 : After downloading the IDM Optimizer, launch it. Now you will see the window as shown above. STEP 3 : Click on "Maximize Now" button. STEP 4 : You will be notified to restart your IDM. Restart it and after that retart your pc.That’s it. You are done. ENJOY. Now open IDM and download any file. You can see that the files are downloaded with better speed than the previous of IDM Optimizer.